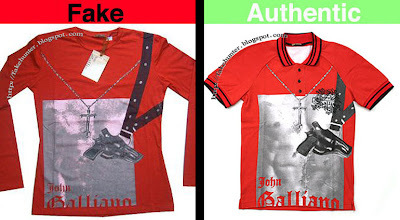 Here are some more comparison photos of real v. fake John Galliano shirts. I know this whole 'spot the difference' game can get a little tedious, but if you're buying online it really is necessary. The upside is that there are some great deals to be had on eBay (and elsewhere...). I don't know where to start with this one. You can pretty much see for yourself the vast difference in print quality (despite the blury pic of the fake). Also, keep the scale of the head in mind, and the lack of text on the fake. The fake example above has less gradation and subtleties, which can be seen in the flowers, and the ribbon around the heart. 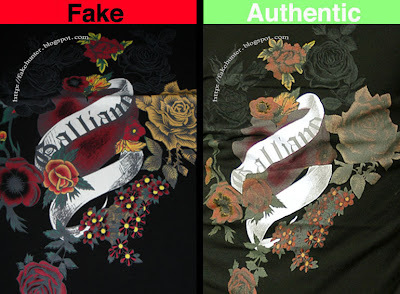 The fake's colors are also over saturated, as usual. The above fake example has over saturated colors, a lack of color subtleties in the cartoons, and the newspaper headlines are smaller, and not as bold. 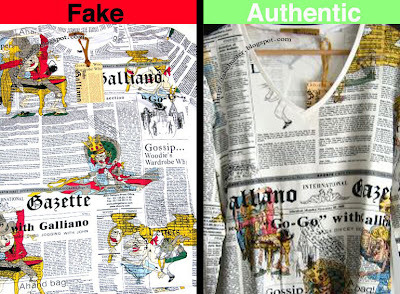 With these napoleon print shirts the fake print is pretty close to the original but there are differences. 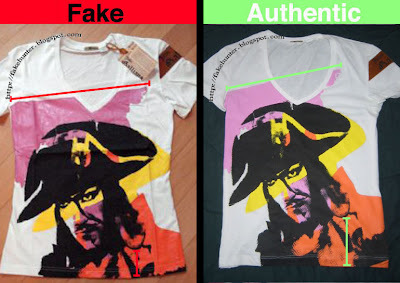 The fake head is larger in scale and the print is less angled than the authentic shirt. I have drawn lines on the photos to highlight the differences in the angles and spacing. 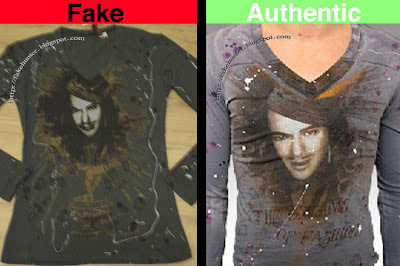 For more real v. fake comparison photos of John Galliano T-shirt designs, click the "print quality" tab under the John Galliano drop-down menu to the right of this page. Or, click here.